The main objective of the two day workshop is to improve and diversify your skills in order to better your position in a very competitive market. The workshop goes above and beyond learning the aesthetics of lighting. From planning to completion the workshop goes into how to apply all elements and skills necessary to create a scene, that kind of stuff that producers look for when hiring a crew. In fact the entire workshop is concentrated in the skills that producers look for, that's the only way today to get business. Clients and producer will not pay you to learn, you have to understand and anticipate their needs and then deliver. You only have one chance to do it right, if you meet their needs they'll call you back, if not they'll call somebody else who will. There has never been a workshop like this one and most likely never will. Unlike other lighting seminars this is a hands-on workshop, it goes beyond just the theoretical applications of lighting techniques. Each session will accept a maximum of 25 participants. Attendees will see and participate in a variety of actual set-ups being recreated from beginning to end as if they were real assignments, many of the exact same set-ups that you see illustrated on this page and you see everyday on broadcasting TV. The program will also discuss in depth the most common problems that crews face on just about every assignment and the skill necessary to overcome such problems. The ultimate goal is to deliver the best quality possible while keeping the production on schedule. How critical are interview skills to your career? Most features and documentaries we see on television today as well as commercial and corporate video projects hinge around interviews. It would appear that placing people in front of a camera for an interview would be an easy process, yet most cameramen today find it difficult going beyond the basic 3 points lighting. Many use the excuse that lighting is an art therefore very subjective, it's a good excuse for those who do not know how to light but producers are not fooled. You have to master the rules and disciplines first before you can break them. Interview skills is the very first skill producers and clients look for when hiring a freelancer, it’s the barometer that indicates the quality and diversity of skills the photographer possesses. If a photographer has the skills to create and light an interview set, meaning the subject as well as creating and lighting a background, then he is also capable of handling any other lighting situations. It's easy to take videos of landscape, sunsets or other generic images or events, they will always look good as long as they are correctly composed and exposed. Clients have no way to make comparisons because no two of them are alike, but people see images of people every day and everywhere, it has become a reference of quality. Subconsciously in seeing images of people we have developed a distinction from what’s great, good or bad. So how much is in reality knowledge worth in cold cash? This is a rate chart for one of the major sports network, and this is just the basic package without extras for a 2 men crew consisting of the Cameraman/DP and Soundman. This is what we get everyday we get hired. For features is even higher depending on the shoot requirements. Not a shabby payday. This is why knowledge is so important to our bank accounts. Live demonstration of the types of lights available today and how each light effects our work. Advantages and disadvantages of each piece of equipment. Setting up the visual elements that create quality interviews. Setting up and lighting single subject, one camera interviews. How to create mood effects with lighting. Setting up and lighting multiple subjects and multi-camera interviews. Creating effective backgrounds and use of props. The importance of the “chiaroscuro” lighting principles and its modern applications. How to control available light. How to get best results when combining available and artificial lights. 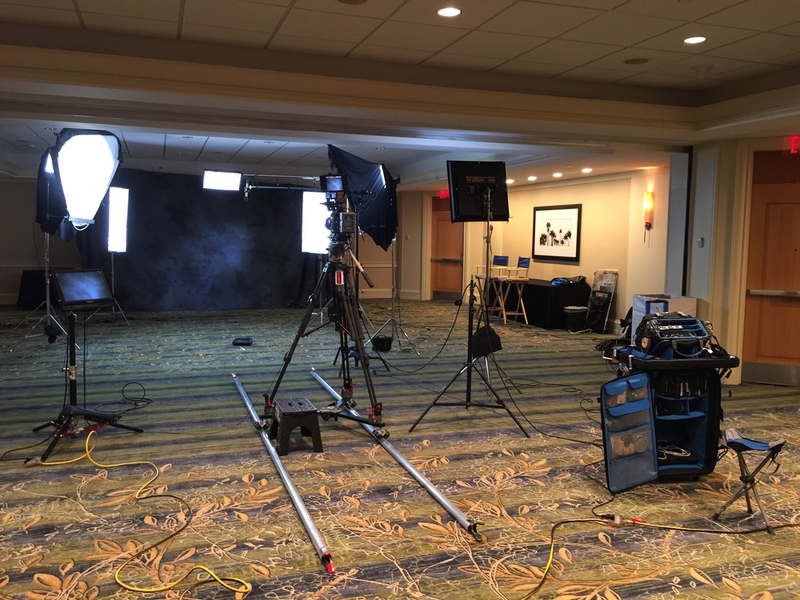 Maximizing available interview space and create quick and effective video-friendly sets where there are none. Grips. What, why, when and how to use them. Fundamental difference between video and broadcasting lighting techniques from motion picture techniques. Problem solving techniques and equipment that will save the day and make you look like a hero in the client's eyes. Creating and customizing marketing effective demo reels to target potential clients. Videographers, TV photographers, either freelancers or staff, those with at least one or two years of active experience in video productions and a strong desire to move ahead in this profession. Producers. This workshop will help you to take-on bigger projects and understand how efficiently a variety of set ups can be created even with limited budgets. Will also assist you in classifying and recognizing if the crew you hire has the skills to work on your assignment. Instructors and educators, this workshop will help you to better understand how theories are applied to clients needs in a fast changing industry, in turn it will help your students to be better and more realistically prepared to enter the work force. Students who graduated from film or broadcasting schools but have difficulties finding jobs in the real world and can not earn enough to support themselves. Still photographers, the lighting techniques that this workshop is based on are the same as those created by renaissance artist in the 15th century. They are equally effective for video productions as they are for still photography. Interviews are moving portraits.